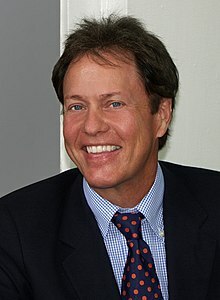 Rigdon Osmond Dees III (born March 14, 1950), best known as Rick Dees, is an American entertainer, radio personality, comedian, actor, and voice artist, best known for his internationally syndicated radio show The Rick Dees Weekly Top 40 Countdown and for the 1976 novelty song "Disco Duck". Dees is a People's Choice Award recipient, a Grammy-nominated performing artist, and Broadcast Hall of Fame inductee. He wrote two songs that appear in the film Saturday Night Fever, plus performed the title song for the film Meatballs. He co-founded the E. W. Scripps television network Fine Living, now the Cooking Channel, and has hosted Rick Dees in the Morning at 102.7 KIIS FM and Hot 92.3 in Los Angeles. Today he continues his own syndicated daily radio show, Daily Dees and the syndicated Rick Dees Weekly Top 40 Countdown. Dees was born Rigdon Osmond Dees III in Jacksonville, Florida, on March 14, 1950. He was raised in Greensboro, North Carolina. Dees graduated from Greensboro's Grimsley High School and the University of North Carolina at Chapel Hill with a bachelor's degree in motion pictures, TV, and radio. Dees began his radio career at a Greensboro radio station called WGBG while still in high school. He worked for various radio stations throughout the southeastern United States, including WCAR (now known as WXYC) in Chapel Hill, North Carolina, WSGN in Birmingham, Alabama, and WKIX in Raleigh, North Carolina. His introduction to the international entertainment arena began while working at WMPS AM 680 ("The Great 68") in Memphis, Tennessee, during the disco craze of the mid- to late-1970s, when he wrote and recorded "Disco Duck" in 1976, that sold more than 6 million copies. The song can be heard in Saturday Night Fever, in a brief scene in which a group of older people were learning to "move their feet to the disco beat". While this platinum recording earned him a People's Choice Award, and the BMI Award for record sales in one year, Dees was expressly forbidden from playing the song on the air by station management (rival stations refused to play it for fear of promoting their competition). Dees was fired from WMPS when he mentioned that his song, "Disco Duck", was almost #1, and his own radio station would not let him play it. The station manager said it was a conflict of interest. Dees did not perform the actual duck vocals on the song since he could not "talk like a duck." The duck vocals were recorded at Shoestring Productions in Memphis, Tennessee by Ken Pruitt, who moved away before the song became popular, and the vocals for the duck were done by Michael Chesney of Memphis for the concert tour. Chesney had done some comedic voices for Dees prior to Disco Duck. The tour went from Disney World to New York, NY, billed as Rick Dees and The Cast of Idiots. After a 45-day non-compete clause in his contract was satisfied, Dees was hired by RKO Radio to do the morning show at WHBQ AM 560 in Memphis. The success of Dees at their Memphis radio station, combined with his TV appearances and hit music, motivated station owner RKO General to offer Rick the morning radio show in Los Angeles at 93KHJ AM. Dees helped their ratings, but AM music radio was rapidly losing ground to FM. When KHJ switched to country music, Dees left KHJ, taking a morning position at KIIS-FM in July 1981. In a short time, he turned KIIS-FM into the #1 revenue-generating radio station in America, with an asset value approaching half a billion dollars. He began his Weekly Top 40 countdown program, still currently in syndication, in September 1983; the show was created after Dees' station KIIS dropped American Top 40 in a dispute over the playing of network commercials. [page needed] The Weekly Top 40 has been heard each weekend in over 200 countries worldwide and the Armed Forces Radio Network. It is distributed domestically by Compass Media Networks and internationally by Dees Entertainment International (through Radio Express). In December 2008, the Weekly Top 40 became the first English-speaking radio show to air in China. The syndicated Countdown is available in several different editions including Hit Radio (for contemporary hit radio stations), Hot Adult (hot adult contemporary radio stations), 80s Edition and 90s Edition on terrestrial radio stations around the world. After 23 years on radio station KIIS-FM, Dees left in 2004 because of a contract dispute, and he was replaced by Ryan Seacrest. Dees returned to Los Angeles radio in August 2006 on KMVN, Movin 93.9, hosting the morning show along with Patti "Long Legs" Lopez and Mark Wong. On April 15, 2009, Movin 93.9 changed format, dismissing its radio personalities and changing the format to Spanish contemporary music after a leasing of the station to Mexico City business Grupo Radio Centro. Dees was one of the last voices on the station before the flip, redirecting listeners of his show to RICK.COM. In April 20, 2011, Dees returned for the second time, this time at KIIS's sister station KHHT (now KRRL), following the station's formatting shift to a Gold-based Rhythmic AC. His show at KHHT lasted for a year. Dees continues distribution of his Rick Dees'Weekly Top 40 Countdown globally to terrestrial radio stations and streaming in the U.S., making it the longest continuously running Hit Music Countdown in the world. He also continues to host the syndicated Daily Dees daily show. Dees has garnered many accolades, including the Marconi Award, induction into both the National Radio Hall of Fame, and the National Association of Broadcasters Hall Of Fame. In 1984, he received a Grammy Award nomination for his comedy album Hurt Me Baby – Make Me Write Bad Checks and has since received the Grammy Governor's Award. His other comedy albums – I'm Not Crazy, Rick Dees' Greatest Hit (The White Album), and Put It Where The Moon Don't Shine have also enjoyed worldwide success. He is an inductee in the North Carolina Music Hall Of Fame, the Tennessee Radio Hall Of Fame, has received the Billboard Radio Personality Of The Year award for 10 consecutive years, received a People's Choice Award, and has been awarded a star on the Hollywood Walk of Fame. In television, Dees hosted his own late-night show on the ABC television network in the early 1990s, Into the Night Starring Rick Dees, which ran for one season and was canceled due to low ratings. He has guest-starred on Roseanne, Married... with Children, Cheers, Diagnosis: Murder and many other hit shows. In addition, Dees hosted the syndicated series Solid Gold from Paramount Television, and his voice has been enjoyed on numerous animated features, including The Flintstones, where he starred as Rock Dees, and Jetsons: The Movie, where he played Rocket Rick. In feature films, Rick Dees starred in La Bamba, portraying the iconic Ted Quillin, the Los Angeles disc jockey who helped launch Ritchie Valens's career. In 1984, Dees (and his record company) made a request of Marvin Fisher, the owner of the copyright in the music of the song "When Sunny Gets Blue", for permission to use the song in a parody of the performance by Johnny Mathis. Fisher refused to grant permission for the use. Dees decided to go ahead and do a parody even without the permission of the copyright holder, using about 29 seconds of the song in a parody album titled Put It Where the Moon Don't Shine. In an unrelated 1991 case, Dees was successfully sued for $10 million in damages. The court found Dees and his business manager acted with "malice and oppression" in diverting profits from Dees' Top 40 countdown program, and gave the judgment to a former business partner. ^ Soundtracks for Meatballs (1979), IMDb.com; accessed June 20, 2015. ^ "NAB Award Winner—Rick Dees" (PDF). Radio Journal. April 2007. Archived from the original (PDF) on March 26, 2009. Retrieved March 24, 2009. ^ Durkee, Rob. American Top 40: The Countdown of the Century. ISBN 0-02-864895-1. New York City: Schirmer Books, 1999. Accessed December 10, 2007. ^ Groupe, Kasan. (2010-09-13) Failed Talk Show Hosts Part 2. Linkroll.com. Retrieved on 2012-04-21. ^ A reference to the text of the decision in Fisher v. Dees appears at Law.UCLA.edu, webpage: "Arch-402-UCLAedu". Archived from the original on December 18, 2008. Retrieved December 18, 2008. .
^ Puig, Claudia (1991-03-20). "Verdict Against Rick Dees: Law: More than $10 million in damages in 'Top 40' radio suit is awarded to ex-partner of KIIS deejay and his business manager". Los Angeles Times. Retrieved 2018-08-20. ^ Roberts, David (2006). British Hit Singles & Albums (19th ed.). London: Guinness World Records Limited. p. 148. ISBN 1-904994-10-5.